The southern section of a very bright 22 degree moon halo captured at 22.45 UT on Dec 5th 2006. 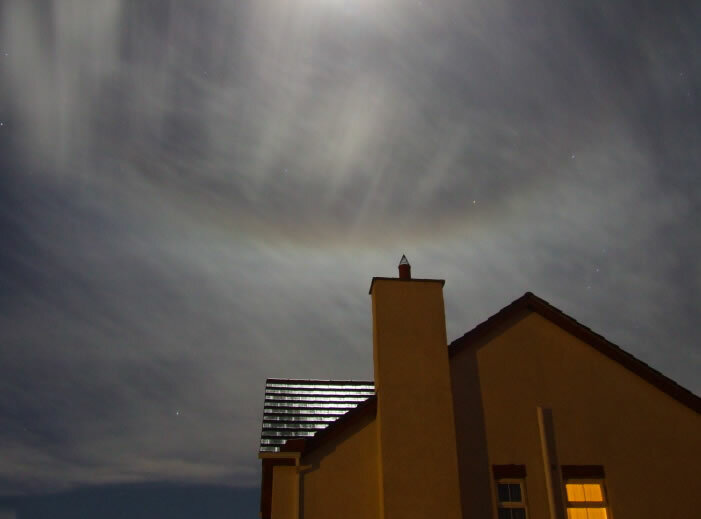 The halo sported bright colours with the naked eye and looked like a smile above my neighbours rooftop. Orion's Belt can be seen above the roof. The high level cirrus type cloud which provided the ice crystals which formed the halo can be seen in the image. The moon was 1 day after full in the eastern sky within Taurus. This was a nice festive surprise from the sky while we were putting up our Christmas tree!